A pack of 8 disposable Blue Umbellaphants round paper dinner plates that measure 22cm in diameter. A gingham border gently leads in to the sweetest baby elephant you've ever seen. It stands holding a polka dotted umbrella beneath a shower of boy hearts, looking so sweet your guests will comment as you set them out on your baby shower table. 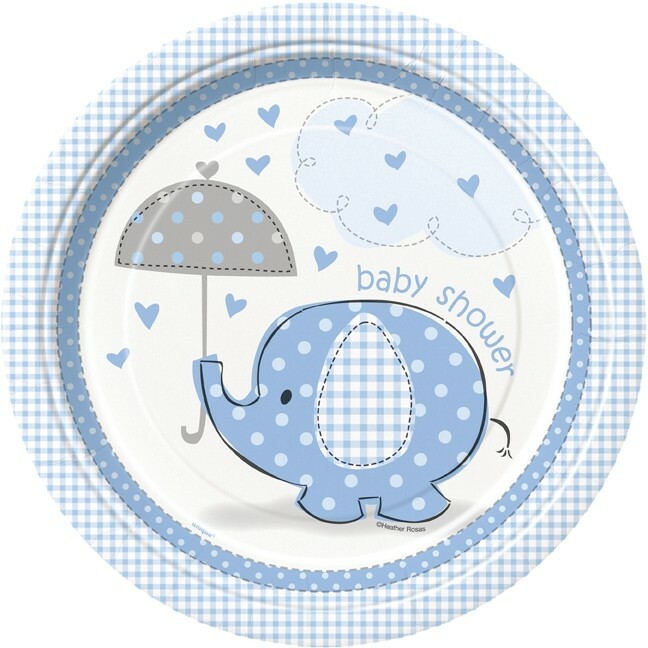 A gingham border gently leads in to the sweetest baby elephant you've ever seen on these Umbrellaphants Boy Dinner Plates, round paper plates that measure 22cm in diameter. It stands holding a polka dotted umbrella beneath a shower of boy hearts, looking so sweet your guests will have to awww as you set them out on your baby shower table.